Very often it is necessary to perform as series of operations on a workpiece at points on a circle centered on an axis of rotation of this workpiece. These operation are spaced at equal angles from each other. Usually the workpiece would be round. An indexing device is essentially for dividing a circle into so many equal parts. Off the shelf indexing systems tend only to divide by small numbers and often was that only have small factors. For example, the highest would be 12 or possibly 24. The factors might only be 2 and 3. The whole point of indexing is that it is very common and needs to be done efficiently and without the possibility of making errors. More complicated indexing systems exist but are complicated. Most indexing systems allow the user to perform the operation at any of the indexed positions but not from one to another. The exception to much of this is the dividing head. It allows indexing for a very wide range of numbers and it allows for operation between one indexed point round to any other. There are two main ways of holding a round workpiece, firstly using collets, secondly using chucks. Collets would usually only be available for smaller diameters. A chuck would be able to hold a would range of diameters. But a collet would often be more accurate than a three jaw chuck. It is also possible, in some cases, to hold the workpiece using mandrels and arbors. The simplest way of indexing is by means of collet blocks. The collet block is a square or hexagonal block with a hole in it designed to take a collet. The workpiece is held in a collet. The collet is held in a collet block. The collet block is held in a vice. It can be held horizontally or vertically. It can also be held in a non-rotating chuck vertically. The whole point of the collet block is that by rotating it one automatically get a rotation of 90º or 60º. More complicated systems exist that index either collets or a chuck. Very often these cuts or holes are equally spaced with the same angle between them. One example of this would be a cylinder cover. In this case an indexing device is very useful. These are usually designed to hold round workpieces and are able to rotate them. They are designed to automatically lock into position at any one of, for example, 24, fixed, equally spaced positions. If any of the holes needed do coincide with all or any of these 24 positions then this is usually the quickest way of doing the job. 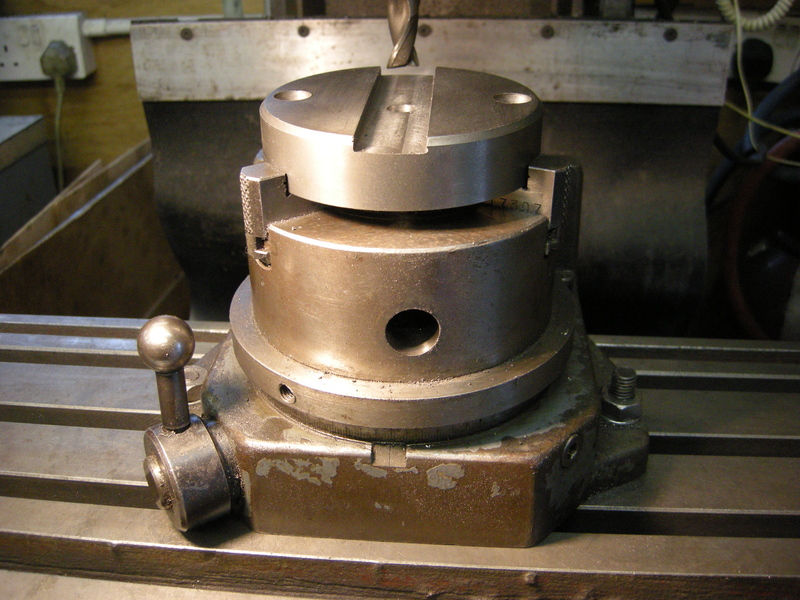 Indexing heads can often hold the workpiece in either the horizontal or vertical plane. Indexed four jaw chucks probably do not exist. Usually when using a rotary device most of the movement of the workpiece is done by the rotation of the device – not the milling table. Very often a whole series of cuts might be made whilst using the indexing device. Whilst doing this the milling table will not move. 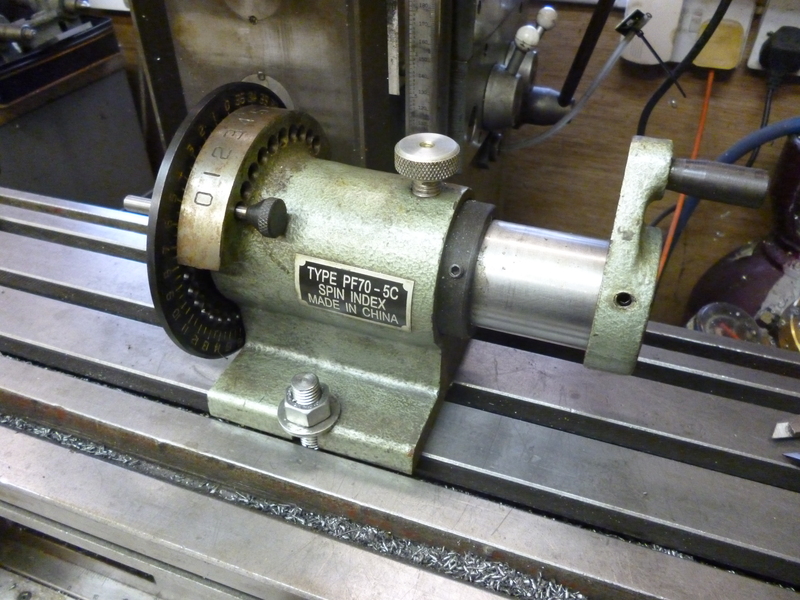 In this sort of case it often makes sense to lock the x and y movements of the milling table. If it is necessary to drill, etc at a place where the indexing method does not lock it then it has to be locked some other way. Most indexing devices are graduated round the edge in degrees. Usually it is possible to lock them at any position. This chuck can be mounted in either the vertical or horizontal positions. There are usually situations where a collet chuck needs to be centered – when it is horizontal or when it is vertical. In this case the axes are at right angles. The best method is with a spigot in the spindle and another of the same diameter in the collet.